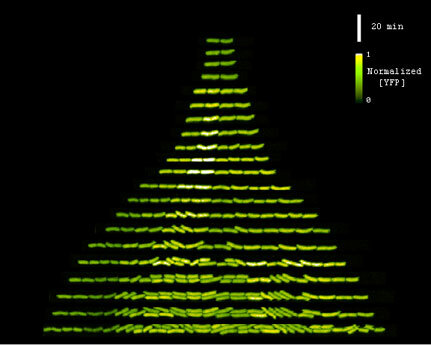 Automated high-density recording electrodes to probe the organization of visual cortex. Each red dot overlaid on a rat brain represents a recording site on a silicon micro-machined electrode array implanted under robotic control. These electrodes allow the activity of visual cortical neurons to be measured, allowing the computational organization of visual processing in cortex to be probed. 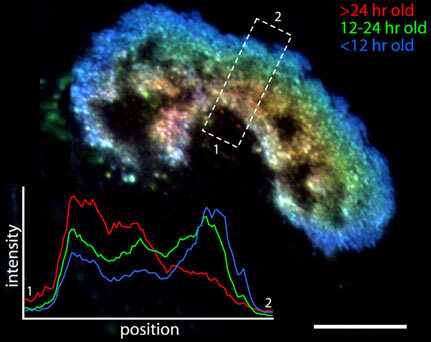 “A laser scanning confocal micrograph of an approximately 15 micron field in the brain of Drosophila. The region shown is the “calyx of the mushroom body”, a region of interest because its synapses have been implicated in memory storage. 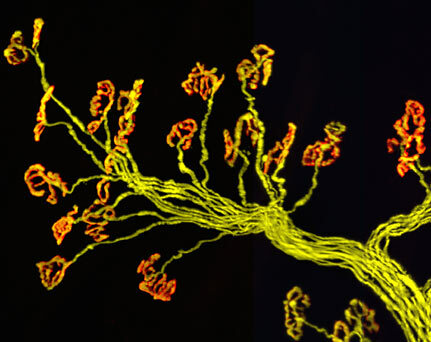 The image shows these synapses in red and green. 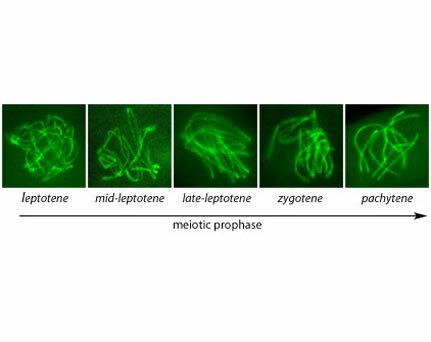 Each of the round or oval fluorescent shapes is a synaptic site, specifically a “pre-synaptic bouton”. 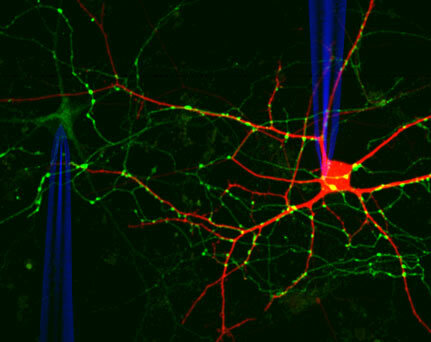 The red fluorescence is the protein choline acetyltransferase, which synthesizes the neurotransmitter acetylcholine in the pre-synaptic zone of the axon terminal. 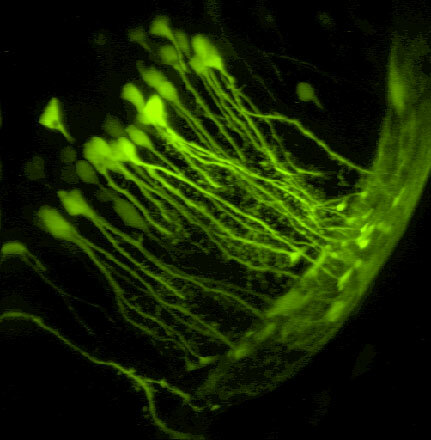 The green fluorescence is the fluorescent protein EYFP, which is localized to the same pre-synaptic zones. The TAP transporter uses the energy from ATP binding and hydrolysis to pump short peptides from the cytosol into the endoplasmic reticulum. These peptides are then loaded on class I MHC molecules and presented to the immune system for detecting virus infection or cancer. 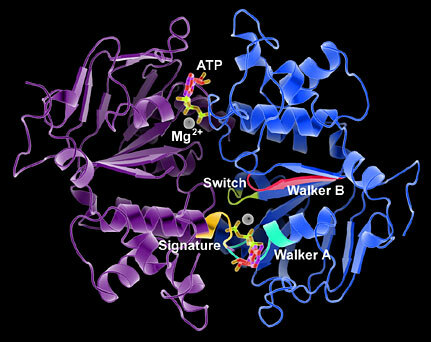 The Gaudet lab uses a combination of structure determination and biochemistry to understand how TAP undergoes important conformational changes during a catalytic cycle. 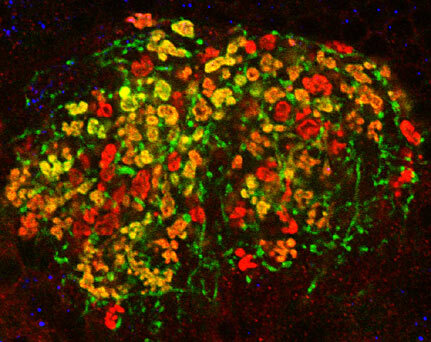 Midbrain dopamine neurons respond to unpredicted rewards. They are thought to broadcast “reward prediction error” signals that act as a teaching signal for reward-based learning. 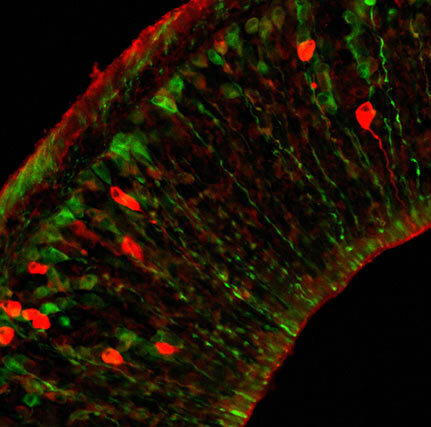 Fast-spiking GABA neurons coordinate critical periods of circuit refinement in the early postnatal neocortex. 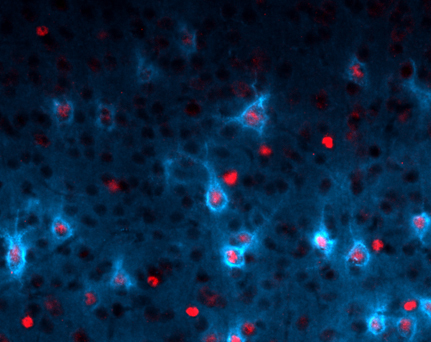 Otx2 homeoproteins (red) control the maturational state of these pivotal cells, which acquire a peri-neuronal net (blue) that limits plasticity with age. 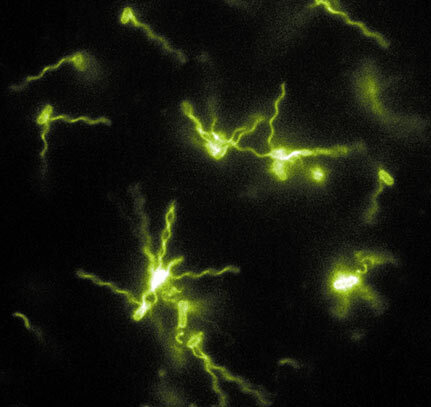 This parvalbumin network is particularly vulnerable in mental disorders. 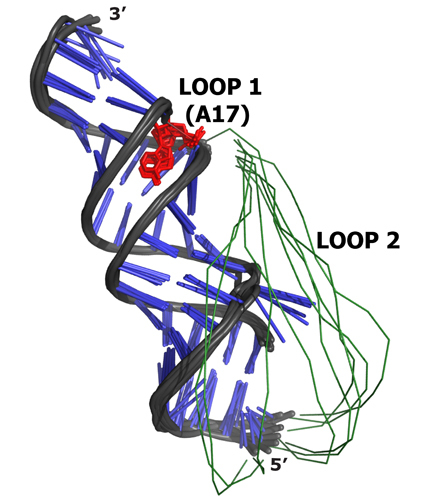 The MLV pseudoknot is protonated at A17 (red) to induce formation of the active structure in which loop 2 (green) engages the RNA double-helix (blue and grey) in a regulated proportion of mRNA molecules. 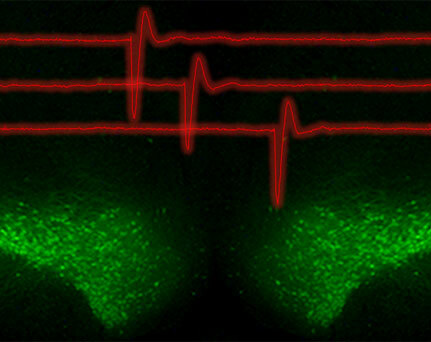 The distribution correlates with the recoding frequency observed in vivo, providing a mechanism for read-through stimulation. 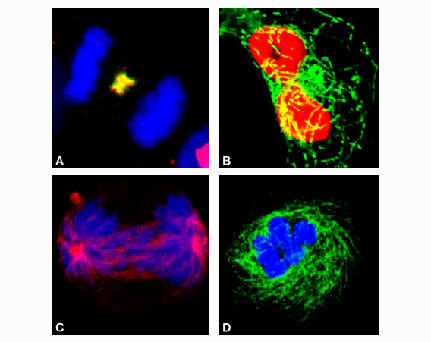 “The protein kinase, Plk1, concentrates on the central spindle during anaphase in mammalian cells. (A. Mol Cell Biol., 1995, 15, 7143; Oncogene, 2004, 23, 763). 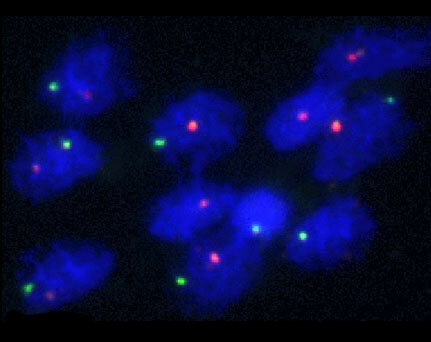 RNAi depletion of Plk1 blocks anaphase completion with unseparated chromosomes. (B. PNAS, 2002, 99, 8672). 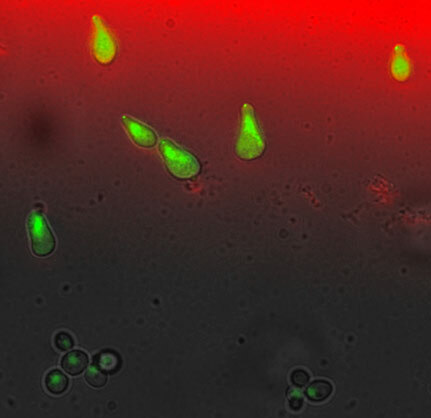 SPERM COOPERATION IN DEER MICE. Sperm from highly promiscuous deer mice (genus Peromyscus) form alliances. These sperm groups swim faster than individual sperm and thus have an advantage in the race to fertilize the female ova. 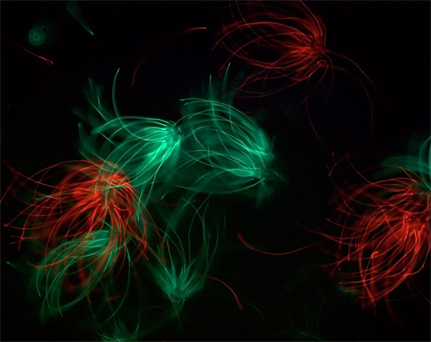 Using fluorescent labeling, it has been possible to show that sperm from two different males (one labeled red, and one green) preferentially cooperate with related sperm — these mice can even discriminate against sperm from a full-sib littermate, which suggests a highly-refined (and yet undescribed) recognition mechanism at the level of sperm cells. This discriminatory behavior does not occur in a closely-related monogamous species, suggesting this complex behavior is driven by sexual selection. 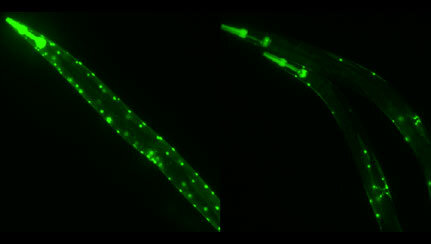 The circadian clock found in cyanobacteria contains a core protein circuit that can sustain robust 24 hour oscillations by post-translational interactions alone. This core oscillator can be reconstituted in a test tube using three recombinantly expressed proteins: KaiA, KaiB and KaiC. KaiC is an autokinase and autophosphatase that can be phosphorylated at two adjacent residues: S431 and T432. 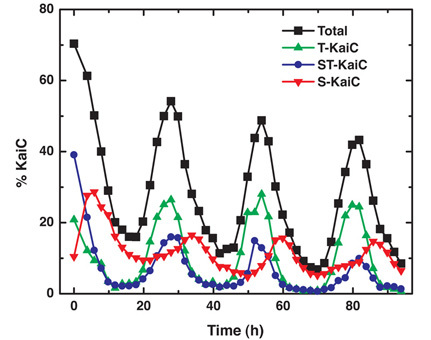 To study the role of multisite phosphorylation in this oscillator system, the abundance of each possible phosphorylated form of KaiC was quantified using mass spectrometry with isotopically labeled peptide standards during a 24 cycle of the oscillator. The plot shows the modification state of the pool of KaiC molecules in an oscillating reaction during three full cycles: KaiC phosphorylated only on T432 (green curve), KaiC phosphorylated only on S431 (red curve), KaiC phosphorylated on both sites (blue curve), and the total fraction of phosphorylated KaiC (black curve). Each form of KaiC peaks at a distinct phase of the reaction, indicating that circadian time is encoded by the phosphorylation state of KaiC. 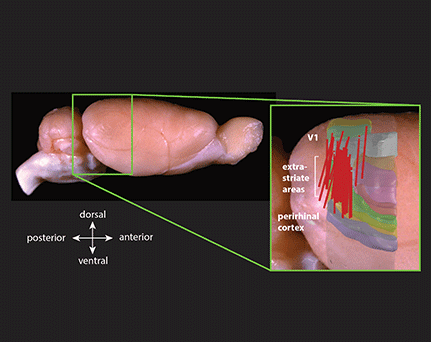 Transgenic expression of YFP in a bundle of axons that innervate neuromuscular junctions in an adult mouse. The red shows the acetylcholine receptors in the muscle membrane that respond the acetylcholine released by nerve terminals. Genealogy in a micro-linear colony of the activity of the MAR (multi-antibiotic resistance) promoter in individual E. coliin response to a steady exposure of salicylate (1mM). 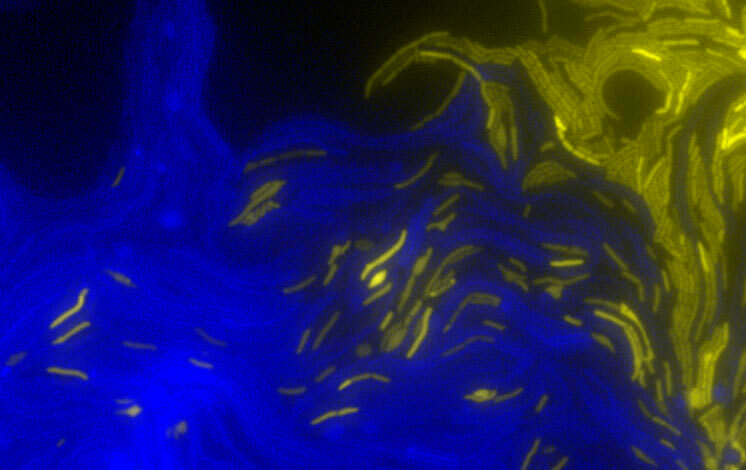 The Venus yellow fluorescent protein reports the activity of this promoter as described in the original proposal. The concentration of Venus is calibrated using Fluorescent Correlation Spectroscopy and is color-coded from dark-green to white, which corresponds respectively to low and high level of expression of the reporter. Here we can visualize to what extent the activity of the MAR promoter, which governs resistance to antibiotics, is inherited from generation to generation. 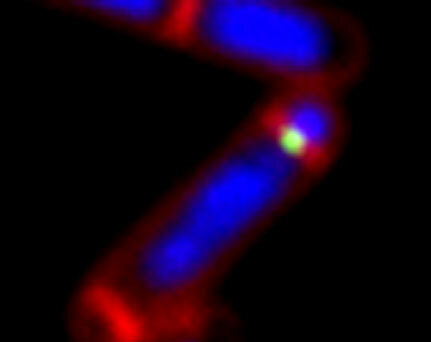 The image is a sporulating bacterium with its membranes stained in red and its chromosomes in blue. The image shows a division septum (upper right) that has partitioned the bacterium into large and small compartments with DNA transversing the septum between the two. The green dot is a DNA translocase that forms a channel in the membrane and is responsible for pumping an entire chromosome across the septum into the small compartment. 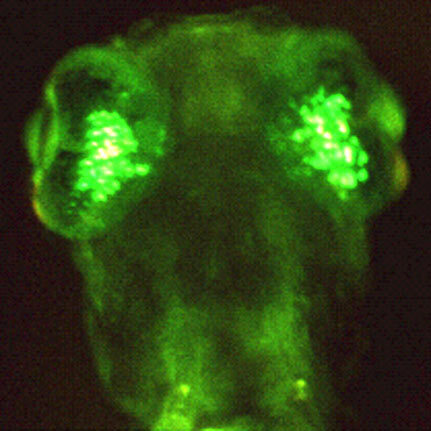 Bulk electroporation can be used to transfect several neurons in intact tadpoles with a protein of your choice (GFP in this case). 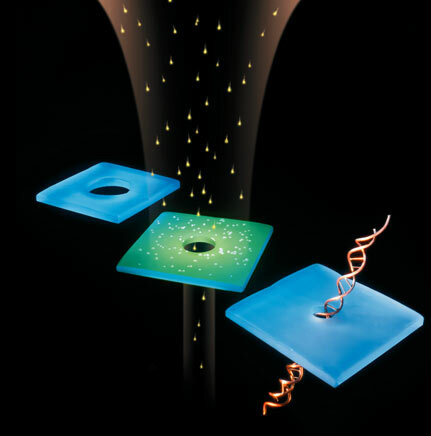 Neurons can then be imaged in-vivo for several days and can in addition be targeted for patch-clamp recordings. This makes it possible to examine in detail the functional and morphological changes of individual neurons during the course of development as well as before and after the application of certain learning paradigms. 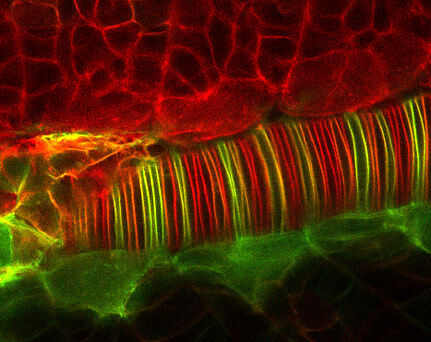 Flourescence micrograph image of a zebrafish embryo that was scatter-labeled with red and green flourescent proteins.The notochord and surrounding tissues are labeled.